From March 7 till March 9, 2008 the x-th version of Rail was held in Houten, near Utrecht in the Netherlands. It was nice show with many excellent lay-outs. I picked out some which I fancied most. I hope you enjoy the photo's as much I enjoyed the show. 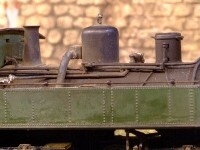 2 The same layout also featured a Meyer compound articulated steam loco. Beautiful in its well detailed green livery. 4 Especially photographed for Dieter: Altbau E-loks. 9 The most eye catching layout of this show was Jacq Damen's layout. The track work wasn't especially impressive. It was long and rather austere. Trains running didn't attract very much attention. Now I mention it, I can hardly remember rolling stock, except for this standard 98 727 mallet tank engine, modified and weathered almost beyond recognition. No, it was the buildings that attracted so many spectators. Their building work is no less than spectacular. My photo's can't even begin to show the beauty and detail of the buildings on this layout. 12 This photo shows the real beauty of the layout. Just one track running along it. But on what a bridge! You can even see the traces of the white lime along the masonry. 19 The signal box was a miracle, a precious gem. 26 A detail. Eine Augenweide, a treat for the eye, would the Germans say. 27 On the layout of the MSVW Weert I found this multiple rail semi turntable switchy thingy. Nice idea if you lack the room. 36 And now you're in for another treat. Fork Creek's Yard is a simple station area in On30, but again (I start repeating myself) what a beauty and love for detail. 47 A very small English layout called Hepton Wharf, built by a British modeler. Scale OO. A masterpiece of only 50 by 150 cm. Just a few tracks, little scenery, but soooo much atmosphere!!! 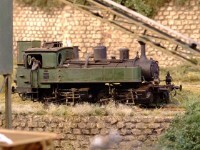 51 Courcelle, a French layout in 7 mm scale, by Richard Chown. 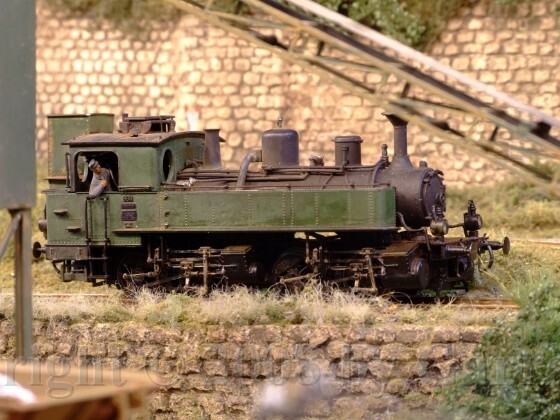 An Englishman building a French layout?? Well, why not??? He did a terrific job. 58 A Dutch layout. Simple yet very nice. 62 NS series 8700 loco. Standard factory stock design from Hohenzollern. 63 The beautiful, compared to the importance of its railway too large, station building of Eext. 66 Crossing in an era where time seemed to matter a whole lot less.